So, I have been searching high and low for a night cream and y'all..I think I may have found it. Have you ever heard of Korres? Me neither. 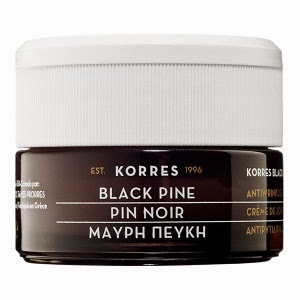 But after sampling their Black Pine Firming, Lifting, & Antiwrinkle Night Cream for a couple weeks, I'm hooked and am clicking the "Submit Order" button as we speak. This cream feels amazing. It is thick and moisturizing without being sticky and oily. I also wake up the next morning not feeling greasy and I can really tell it has been helping with my skin's elasticity. Hence the "firming" in the title. Buyer beware: the scent is a little strong and if you apply too close to your eyes, they will sting. However..worth it. And I may be trying the serum pretty soon, too.